The Art of the Rothschilds. 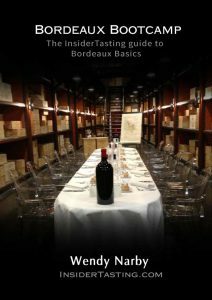 In 2013, I wrote about inauguration of the new Chateau Mouton Rothschild Museum of Wine in Art, which, alongside the spectacular collection of historical artefacts from the world of wine, exhibits all the original artwork behind the Château Mouton Rothschild labels chosen each year, since 1945, for the new vintage. Now they have another one to add to the collection: Yorkshireman David Hockney has been commissioned for the illustration of the 2014 vintage. Known for his pop art style and constantly reinventing himself, including painting via his i-pad, it is a fitting choice as he was not only a personal friend of Baroness Philippine de Rothschild, who died in 2014, but 2017 will see a retrospective of his work to be shown in London, Paris (the Centre Pompidou) and New York. Chateau Mouton Rothschild now belongs to Baroness Philippine’s three children, Camille Sereys de Rothschild, Philippe Sereys de Rothschild and Julien de Beaumarchais de Rothschild. Their investment in art does not stop at continuing the tradition of their mother in the choice of iconic artists for the labels. So it’s fitting that the first action of the foundation was to create the Clerc Milon Dance Prize, distinguishing a promising young dancer from the Bordeaux National Opera Ballet Company. Alongside Chateau Mouton Rothschild the family also owns two other classified growths of Pauillac: Chateau Clerc Milon, acquired by Baron Philippe in 1970, and Chateau d’Armailhac owned since 1933. 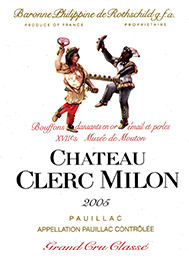 Naming the award after Chateau Clerc Milon is appropriate as the property is linked to the world of dance: in 1983 the label of the Chateau was redesigned and illustrated by a pair of dancers. These dancers, made of gold, enamel and pearls are the work of a 17th-century German goldsmith and are part of the collection displayed in the Museum of Art in Wine at Château Mouton Rothschild. The second wine of the property is called La Pastourelle, after the dance they appear to be performing. The award ceremony, the Foundation’s first event, took place this July in front of the ultra modern new Chateau Clerc Milon winery. The unusual wood-cladded cellar was built in 2011, and, as well has having the latest wine technology available, it has an amazing terrace overlooking the vines of both Mouton and neighbouring Lafite Rothschild. The view across the vines from the terrace of Clerc Milon. But this was no ordinary awards ceremony. The prize was awarded based on the jury’s presence at the three ballet performances in this season’s programme at the Bordeaux National Opera: La Reine Morte, Giselle and The Messiah. Before the award was announced, guests were privileged to see the company perform excerpts of each ballet, in what was a breath-taking and very moving performance, all the more so given the choice of venue amongst the vines of Clerc Milon and later on the terrace overlooking a spectacular sunset. And the winner? As well as favouring a Brit for the last vintage label of Mouton Rothschild, they chose a Brit as one of the winners. I say one, the 2016 prize was awarded to two young artists, as the jury couldn’t decide. Ashley Whittle, the British dancer who trained at the Royal Ballet School before joining the Bordeaux National Opera Corps de Ballet in 2010 was joint winner alongside the French dancer Claire Teisseyre, recently named soloist. As well as a grant of €5,000 from the Foundation and the 2016 Clerc Milon Dance Prize trophy they were given Château Clerc Milon wine from the year of their birth. Art is intimately woven is into the fabric of this vineyard. The stated objective of the Foundation is to be inspired by the eclecticism and freedom of the person whose name it bears, rewarding and supporting the work of many talented individuals, nurturing the inventiveness and skill, which underlie the magic of artistic creation. So art is not only on the labels of the wines, but also on the stage, in the architecture of the new cellars and perhaps most importantly, in the bottle.